Click to view interactive commute map. Commuter flows for workers who live in Brown County, Texas in 12 unique census tracts, traveling between 0 miles and 100 miles. Data for this visualization is from US Census American Community Survey (ACS) data combined with Google MAPS API. 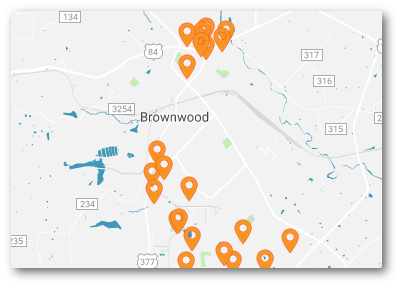 The following illustrates the number of commuters who work in Brownwood but do not live in the City of Brownwood or Early. Commuter numbers were provided by the largest 12 employers in of May 2012. This does not represent all commuters.